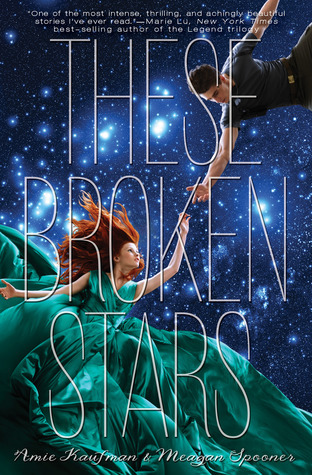 So many bloggers talked about These Broken Stars and you may wonder has it lived up to the hype? My answer is absolutely 100% YES. I'm freaking loving this book. I have a feeling that my review won't do this book justice because sometimes it's just hard to put all those feelings into words. At first glance at the cover (or read the synopsis), you may think this book is just about the romance. Oh no it's more than that. The fun begins when Lilac and Tarver survive from the crash and find themselves on a strange planet. And let me tell you this book scared the crap out of me. You know the feeling when someone tells you that you may get frighten if you go there and you just laugh at them. You believe that nothing can scare you and go on ahead and then it happens. Oh yeah I was like that. I laughed (not really laugh but you get the idea right) at the whisper thing. But as the story goes on and the whisper becomes more than just a whisper I was like "O.M.G. did the temperature just drop or something." It really gave me the chills. This is one of those books when I read it, I'm so thankful that I were not there, on that strange planet with no civilization and with someone/something lurking around doing who knows what (creepy!!!!! ).